Temples of The Church of Jesus Christ of Latter-day Saints are buildings dedicated to be a House of the Lord, and they are considered by church members to be the most sacred structures on earth. Upon completion, temples are usually open to the public for a short period of time (an "Open House"). During the Open House, the church conducts tours of the temple with missionaries and members from the local area serving as tour guides, and all rooms of the temple are open to the public. The temple is then dedicated as a "House of the Lord," after which only members twelve years of age and older who hold a current temple recommend are permitted entrance; temples are not churches but are places of worship. There are 163 dedicated temples (152 currently open; and 11 previously dedicated, but closed for renovation), 11 under construction, and 35 announced (not yet under construction). Within temples, members of the church make covenants, receive instructions, and perform sacred ordinances, such as: baptism for the dead, washing and anointing (or "initiatory" ordinances), the "endowment," and eternal marriage sealings. Ordinances are a vital part of the theology of the church, which teaches that they were practiced by the Lord's covenant people in all dispensations. Additionally, members consider the temple a place to commune with God, seek His aid, understand His will, and receive personal revelation. In 1832, shortly after the formation of the church, Joseph Smith said that the Lord desired the saints build a temple; and they completed the Kirtland Temple in 1836. 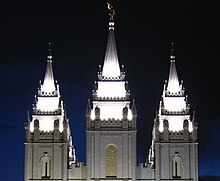 Initially, the church constructed temples in areas where there were large concentrations of members: Utah, Idaho, Arizona, Hawaii (all in the USA), and Alberta (Canada). In the mid 20th century, because of the importance of temples in the theology, the church tried to balance density with the travel requirements attending the temple imposed upon members. Thus, temples were built in Europe (namely, Switzerland dedicated in 1955 and England dedicated in 1958); the Pacific Islands (namely, New Zealand dedicated in 1958); and Washington, D.C. (dedicated in 1974, the first American temple East of Utah since Nauvoo in 1846). All were dedicated at a time when membership in the region alone might not have justified the effort. In the 1980s, Spencer W. Kimball directed the church to build smaller temples with similar designs allowing temples to be built where there were fewer members. As a result, the first temples in South America (Brazil dedicated in 1978); Asia (Japan dedicated in 1980); and Mexico (Mexico City dedicated in 1983) were built and the number of temples doubled from 15 to 36. Church president Gordon B. Hinckley (1910–2008) also accelerated the construction of temples through the use of an even smaller standardized base design. In 1998, when there were 51 temples, Hinckley set a goal to have 100 temples in place before the end of 2000. Between the brief building period from 1998 to 2001, 38 of these standardized temples were constructed and dedicated, meeting Hinckley's goal by having 102 dedicated temples before 2000 closed. During Hinckley's service as president, the number of temples more than doubled from 47 to 124. On October 7, 2018, Russell M. Nelson announced the intent to construct 12 more temples, putting the church's total number of temples operating, under construction, or announced above 200. The Endowment House was not dedicated as a temple and was not considered a temple, but rather was used to perform certain temple functions until it was ordered dismantled in 1889. A private dedication was held on January 1, 1877 by Erastus Snow. The original tower of 147 feet was disliked by Brigham Young and was struck by lightning and burned to its base after Young's death. It was rebuilt according to Young's original design with a 175 ft (53 m) tower. Wilford Woodruff performed a private dedication on May 17, 1888. 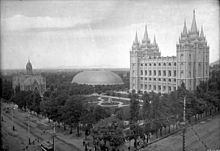 The Salt Lake temple was dedicated in 31 sessions held between April 6 and 24, 1893. Thomas S. Monson rededicated the Laie Hawaii Temple on November 20, 2010 following nearly 2 years of renovations that began December 29, 2008. The remodel completed in 1978 expanded the temple from 10,500 square feet (980 m2) to over 47,000 square feet (4,400 m2). An addition was completed in 1962 and was dedicated on July 2, 1962 by Hugh B. Brown. The first temple to offer ordinances in a language other than English (Spanish). Modern, center spire - designed by John Fetzer, Sr.
Bern was the first temple to present the endowment using a movie, necessitated by the multiple languages required to support the members in Europe. The original Samoa temple was dedicated in 1983 and destroyed by fire while the temple was closed for renovations in 2003. This new temple of a similar design was built on the same site although it is substantially larger. The LDS Church continues to list this as the 22nd operating temple, in accordance to its original dedication date. The Tongan temple was rededicated 4 November 2007 following remodeling that began in June 2006. The Mexico City Mexico Temple was closed March 30, 2007 for renovations and was rededicated Sunday, 16 November 2008. The temple was again closed in early 2014 for renovations. A public open house was held from Friday, 14 August 2015, through Saturday, 5 September 2015, excluding Sundays. The temple was rededicated on Sunday, September 13, 2015. The rededication in 1987 was for an addition only. The Boise Idaho Temple was closed for additional renovations in July 2011 and rededicated in November 2012. Originally without an angel Moroni statue, one was installed as part of the 2001–2002 renovations. It is the only temple ever to have been located behind the Iron Curtain. Modern, single-spire design - designed by Allward-Gouinlock Inc.
Modern, two-tower - designed by William S. Lewis, Jr.
Classic modern, single-spire design - designed by Arquitechior Langdon, SA. Classic modern, single-spire design - designed by Paul Tessier & Associates and Church A&E Services. Classic modern, single-spire design - designed by Tisdel Minckler and Associates. 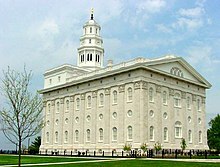 Built on the site of the Nauvoo Temple and dedicated on the 158th anniversary of the death of Joseph Smith, the exterior is an almost exact reconstruction of the original temple. Primary difference is weather-vane has been replaced with a statue of Moroni. However, the interior has 4 progressive ordinance rooms with murals like those in the early Utah temples leading to the celestial room and 6 sealing rooms. Temple dedicated on 1 June 2008 following an open house from 10 May to 24 May 2008. Temple dedicated on 10 August 2008 following an open house from 11 July to 26 July 2008. First temple dedicated in Panama. Fourth temple dedicated in Idaho and, during 2008, the second temple dedicated in Idaho that year. The 12th temple dedicated in Utah, the Draper Utah Temple has been operating since March 2009. 13th temple in Utah and 130th LDS temple. Open house was held in April and the dedication 2 May 2010. First temple in British Columbia and 6th in Canada. Announced by Thomas S. Monson on April 26, 2008. Announced by letter to local priesthood leaders in April 2006. Announced in a letter dated 7 November 2007 from the First Presidency to priesthood leaders. The public open house was held from Friday, 1 July 2011, until Saturday, 23 July 2011, following which the temple was dedicated on Sunday, 21 August 2011, in three sessions. Announced by Gordon B. Hinckley at the groundbreaking of the Oquirrh Mountain Temple, and dedicated by Dieter F. Uchtdorf. Announced at the 178th Semiannual General Conference. Ground was broken May 8, 2010 by Ronald A. Rasband during an invitation-only ceremony. An open house was held from April 7 to 28, 2012, with the dedication held on May 6, 2012. The temple will serve approximately 44,000 members. Announced by Thomas S. Monson in General Conference, October 3, 2009. Announced at the 178th Semiannual General Conference. Ground was broken in a small ceremony on 12 September 2009 after a new site was selected. Previously ground had been broken on 9 June 2007 by Spencer V. Jones, excavation was halted because of opposition from Tegucigalpa city officials and citizens, who felt the temple would overshadow and block the view of the Catholic Our Lady of Suyapa Basilica on adjacent land. After negotiations failed to resolve the issue, the church announced on Wednesday, 28 January 2009, that out of respect for the city officials and citizens, the church would relocate the temple. Announced by Thomas S. Monson on April 26, 2008, to be built on the southeast corner of Pecos and Greenfield Roads. A public open house was held from January 18 to February 15, 2014. The temple was formally dedicated on March 2, 2014. Announced by Thomas S. Monson in General Conference, October 3, 2009. Ground was broken on June 18, 2011 by Walter F. Gonzalez. A public open house took place from March 29 to April 19, 2014. The temple was formally dedicated on May 4, 2014. Announced by Thomas S. Monson on May 24, 2008. A public open house was held from October 10 to November 1, 2014. The temple was formally dedicated on November 16, 2014 by Thomas S. Monson. Announced at the 178th Semiannual General Conference.. A public open house was held from 17 April-2 May 2015, excluding Sundays, and the temple was dedicated in three sessions on 17 May 2015. Announced by Thomas S. Monson on January 25, 2010. A public open house was held from April 24-May 23, 2015, excluding Sundays, and the temple was dedicated in three sessions on June 7, 2015. Announced by Thomas S. Monson in General Conference, October 2, 2010.A public open house was held from Friday, July 17, 2015, through Saturday, August 8, 2015, excluding Sundays. The temple was dedicated on Sunday, August 23, 2015. Announced by Thomas S. Monson on October 2, 2010, during General Conference. Ground was broken to commence construction on 18 August 2012. A public open house was held from Friday, 13 November 2015, through Saturday, 28 November 2015, excluding Sundays. The temple was formally dedicated on Sunday, December 13, 2015. Announced by Thomas S. Monson on October 1, 2011 LDS spokesperson reported that it will be called the Provo City Center Temple. Announced by Thomas S. Monson in General Conference on 3 October 2009. Ground was broken on 22 October 2011 by Gary E. Stevenson. Michael T. Ringwood and Koichi Aoyagi of the Seventy were also present. On October 2, 2010, Thomas S. Monson announced that the Hartford, Connecticut temple would be built. Originally a temple in Hartford was announced in the early 90s; however, in 1995 efforts towards construction were abandoned and it was announced that 2 temples would be built instead: the Boston Massachusetts Temple and the White Plains New York Temple. Thomas S. Monson confirmed on 15 July 2011 that the church "hope[d] to build [a] temple in France" near Paris, and on 1 October 2011 announced that the plans were "moving forward." In 2014, a news story from the church noted that work had commenced on the temple, though no formal groundbreaking had taken place. Announced by Thomas S. Monson in General Conference, 3 October 2009. Note: Numbering of temples announced or under construction is tentative (which is indicated by placing the numbers in italics) and based upon the groundbreaking date, or the date of announcement if no groundbreaking has taken place. Permanent numbering may change depending upon the date of dedication. Announced by Thomas S. Monson in General Conference, 3 October 2009. Ground was broken on the seventh temple in Brazil by David A. Bednar on November 15, 2011. Announced by Thomas S. Monson in General Conference, 2 October 2010. Announced by Thomas S. Monson on 2 October 2010. The following is a list of temples that had been announced and in some stage of development, but whose construction is no longer being pursued. Site Dedicated August 1, 1831 when cornerstones laid by Joseph Smith. The plat for the City of Zion (Independence, Missouri) originally called for 24 temples at the center of the city. A temple has never been built at this location because the temple's site, as designated by Joseph Smith, is occupied by a Latter Day Saint movement denomination known as the Church of Christ (Temple Lot). Site dedicated. Laid out by Brigham Young (although no cornerstones were laid). Never built because of 1838 Mormon War. Design was to be similar to Kirtland Temple. Site dedicated and temple announced on April 26, 1838 by Joseph Smith. Site Dedicated. Cornerstones laid and dedicated April 26, 1839. Efforts discontinued in 1800s. The cornerstones remain, covered in glass, as part of a memorial park at the site. Originally named the White Plains New York Temple the temple was renamed to the Harrison New York Temple. Along with the Boston Massachusetts Temple, it was to be built instead of the Hartford Connecticut Temple announced in October 1992. Reportedly, efforts were still underway in 2004, though delayed by lawsuits and objections by local officials. However, this temple was removed from the list on the Church's official temple website soon after the dedication of the Manhattan New York Temple. ^ Hinckley announced the use of smaller standardized temples in 1997 ( Hinckley, Gordon B. "Some Thoughts on Temples, Retention of Converts, and Missionary Service". 167th Semiannual General Conference, October 1997. Retrieved October 30, 2006. ). The base design is about 10,700 square feet (990 m2), and temples built from the design are generally between 10,000 and 18,000 square feet (930 and 1,700 m2). These temples generally do not include a large laundry facility, do not provide members with the ability to rent temple clothing, nor provide a cafeteria for members (Almanac, 2000). ^ Hinckley, Gordon B. "New Temples to Provide 'Crowning Blessings' of the Gospel". 168th Annual General Conference, April 1998. Retrieved October 30, 2006. ^ Because the two church presidents before Hinckley (Kimball and Ezra Taft Benson) had incapacitating illnesses during the latter part of their administration, Hinckley dedicated a total of 84 temples, even though, during his presidency, 14 temples were dedicated by others: James E. Faust (7), Thomas S. Monson (6), and Boyd K. Packer (1). ^ "Twelve Temples Announced as October 2018 General Conference Closes: Number of temples operating, announced or under construction now above 200". Newsroom. LDS Church. October 7, 2018. ^ Atlanta Georgia Temple set to close in July for renovation (April 4, 2009). Church News published by Deseret News Publishing Company. Last accessed April 26, 2009. ^ After being closed again for renovation in 2014, a rededication took place on Sunday, 13 September 2015. ^ "Boise Temple To Be Closed For Renovation", Newsroom (Press release), LDS Church, May 20, 2011, retrieved October 26, 2012 . ^ "Freiberg Germany Temple to Be Rededicated" (Press release). The Church of Jesus Christ of Latter-day Saints. August 16, 2002. Retrieved September 29, 2006. ^ A prior rededication by Gordon B. Hinckley took place on 7 September 2002. ^ a b "Two new temples: Gilbert, Gila Valley". Church News. April 26, 2008. Retrieved March 22, 2017. ^ "New Temple Announced in Cebu, Philippines" (Press release). Newsroom – The Church of Jesus Christ of Latter-day Saints. April 29, 2006. Retrieved May 6, 2015. ^ a b c d Mikita, Carole (October 4, 2008). "LDS Church plans temples in Rome, 4 other locations". KSL.com. Retrieved October 15, 2012. ^ Burnes, Brian (May 8, 2010). "Groundbreaking planned for Mormon temple in Northland" (NewsBank paywall). The Kansas City Star. p. A5. Retrieved October 15, 2012. ^ a b c d "President Thomas S. Monson: 'Welcome to Conference'", Deseret News, October 3, 2009, retrieved November 6, 2012 . ^ a b c d Talor, Scott (October 4, 2009), "Brigham City among five new locales for LDS temples", Deseret News, retrieved November 6, 2012 . ^ a b c d Taylor, Scott (October 2, 2010), "President Thomas S. Monson opens conference by announcing 5 new temples", Deseret News, retrieved November 11, 2012 . ^ Walker, Joseph (October 1, 2011), "LDS general conference opens with the announcement of six new Mormon temples", Deseret News, retrieved November 9, 2012 . ^ "New Temples Announced for France, Democratic Republic of Congo, South Africa, Colombia, Utah and Wyoming", Newsroom (News Release), LDS Church, October 1, 2011, retrieved November 9, 2012 . ^ Walker, Joseph (March 23, 2012), "It's official: the Provo City Center Temple", Deseret News, retrieved November 9, 2012 . ^ Weaver, Sarah Jane (September 18, 2016). "President Eyring dedicates temple in Philadelphia, the place 'where so much began'". Deseret News. ^ "Fort Collins Colorado Temple", ldschurchtemples.com, retrieved April 2, 2011 . ^ "Site Announced for Fort Collins Temple", LDS Newsroom, The Church of Jesus Christ of Latter-day Saints, retrieved August 10, 2011 . ^ a b c Walker, Joseph (October 1, 2011). "LDS general conference opens with the announcement of six new Mormon temples". Deseret News. Salt Lake City. Retrieved October 1, 2011. .
^ a b c "Mormon church president announces plans for new temples in Utah, Wyoming, Colombia, Africa". Washington Post. AP. October 1, 2011. Retrieved October 5, 2011. .
^ "President Thomas S. Monson: Welcome to conference; 5 new temples", Deseret News, October 2, 2010, retrieved August 18, 2013 . ^ "Church Statement on Temple in France" (15 July 2011). ^ Monson, Thomas S. (1 October 2011. "As We Meet Again" talk given at General Conference. ^ "Elder Andersen visits construction site of Paris France Temple", Church News and Events, lds.org, 19 June 2014. Retrieved 22 June 2014. ^ Mandy, Morgan (October 8, 2012). "LDS Church announces plans for new temples in Arizona and Peru". Deseret News. Retrieved October 18, 2012. ^ "Tucson to get its own Mormon temple". Arizona Daily Star. October 7, 2012. Retrieved October 18, 2012. ^ "New temples announced for Tucson, Arizona and Arequipa, Peru". Church News. October 6, 2012. Retrieved October 18, 2012. .
^ a b Walker, Joseph (April 6, 2013). "LDS react with joy to temples announced in Cedar City, Rio". Deseret News. Retrieved April 6, 2013. .
^ Walker, Joseph (October 1, 2011). "LDS general conference opens with the announcement of six new Mormon temples". Deseret News. Salt Lake City. Retrieved October 1, 2011. ^ Walch, Tad (April 5, 2015). "3 new LDS temples to be built in Ivory Coast, Haiti and Thailand, President Monson announces". Deseret News. Retrieved April 5, 2015. .
^ "Groundbreaking Held for the First Temple in Portugal". Newsroom, United Kingdom. LDS Church. December 5, 2015. ^ Winnipeg Manitoba Temple, ldschurchtemples.com. Last accessed on April 2, 2011. ^ Mandy, Morgan (October 8, 2012). "LDS Church announces plans for new temples in Arizona and Peru". Deseret News. Retrieved October 18, 2012. .
^ "Mormon Church Lowers Age Limit for Missionaries". ABC News. AP. October 6, 2012. Retrieved October 18, 2012. .
^ a b c d e "President Monson Announces Five New Temples: Mormon temples to be built in South America, Africa, Philippines and US". Newsroom. LDS Church. April 2, 2017. ^ a b c d Toone, Trent (April 3, 2016). "President Monson announces 4 new temples at Sunday morning session". Deseret News. .
^ a b c d e f "Seven Temples Announced as April 2018 General Conference Closes: Mormon temples to be built in Asia, Europe, North and South America". Newsroom. LDS Church. April 1, 2018. ^ "Seven Temples Announced as April 2018 General Conference Closes: Mormon temples to be built in Asia, Europe, North and South America". Newsroom. LDS Church. April 1, 2018. ^ History of the Church of Jesus Christ of Latter-day Saints (aka Documented History of the Church "DHC") 1:357-362 or James R. Clark, Messages of the First Presidency, Vol.1, p.6-10 where full architectural descriptions are given. ^ "Temples Renamed to Uniform Guidelines". Church News. The Church of Jesus Christ of Latter-day Saints. October 16, 1999. Retrieved July 5, 2011. ^ "Report of the 162nd Semiannual General Conference". LDS.org. Salt Lake City: The Church of Jesus Christ of Latter-day Saints. November 1992. Retrieved July 25, 2007. ^ According to a Deseret News article about the Manhattan Temple. "N.Y. Temple to Get Spire". Deseret News. Salt Lake City: Deseret Management Corporation. June 10, 2004. Retrieved October 19, 2007. Satterfield, Rick. "Temples of The Church of Jesus Christ of Latter-day Saints". LDSChurchTemples.com. Archived from the original on 16 July 2014. Retrieved 8 August 2014. Hawkins, Chad (2001). The First 100 Temples. Deseret Management Corp.
Packer, Boyd K. (June 1980). The Holy Temple. Bookcraft Publications. ISBN 0-88494-411-5. Wikimedia Commons has media related to Temples of The Church of Jesus Christ of Latter-day Saints. This page was last edited on 22 April 2019, at 21:40 (UTC).